STAMPS: Peony Scrolls by Altenew. ACCESSORIES: Jen Hadfield tag by Pebbles from Simon Says Stamp; Tim Holtz Burlap stencil; Wendy Vecchi Metallic Gold embossing paste; Jute twine, Dew drop, Glossy Accents. I went with a very clean and simple design based on the new MFT Wednesday Sketch Challenge. The horizontal flag element is almost invisible because I opted to use a heart die border in vellum so I wouldn't cover up the sentiment. 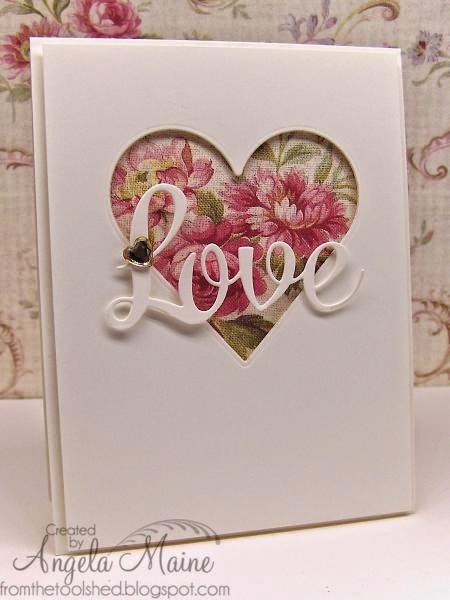 The patterned paper has an embossed, glittery finish to it and the sentiment was clear embossed to add some shine. I know it has some pink, but think it could possibly pass as a masculine Valentine (I know...that might be a stretch!). 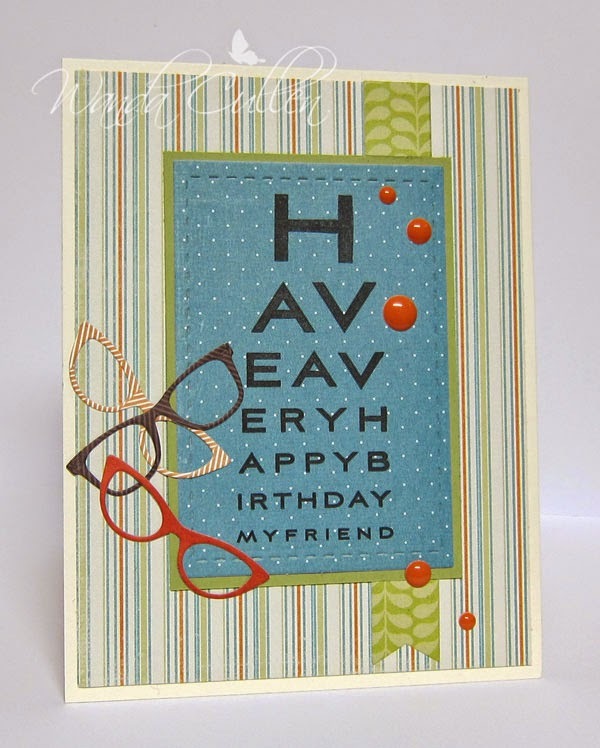 Another card completed for my little "eye chart collection" I'm putting together for a gift. PAPER: Nana's Nursery Baby Girl by DCWV, Simply Chartreuse (PTI), White, Vellum. ACCESSORIES: Heart and large label Die-Namics (MFT), Enamel dot, Heart paper clip. I was working on a watercoloring technique this weekend after watching Kristina Werner's tutorial video HERE. So, here is my attempt using the following distress inks: Crushed Olive, Dusty Concord, Peacock Feathers, Squeezed Lemonade. 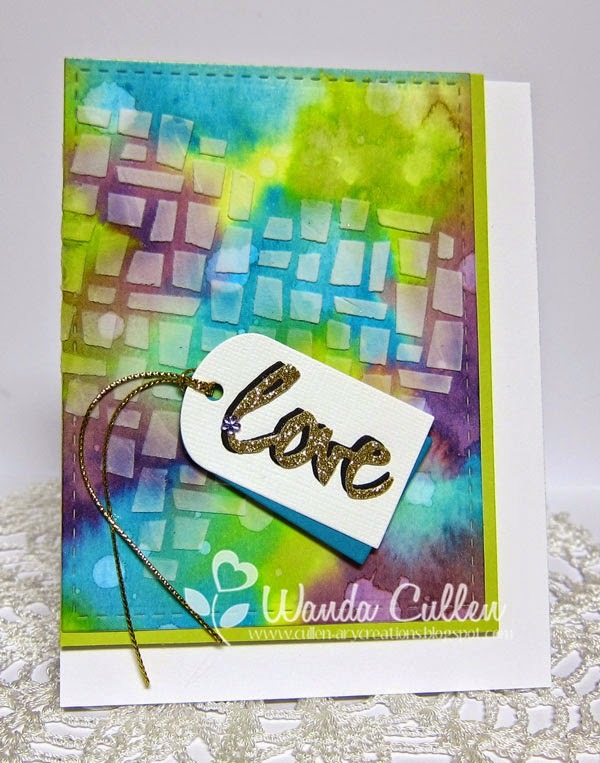 After the background was dry, I used the mosaic heart stencil by Simon Says Stamp to add light modeling paste. I didn't want to cover up much of the heart, so opted for a simple layered tag with a love word die. The watercolor panel was layered on Limeade Ice CS by Papertrey Ink. I can hardly believe this is the last Wednesday of January, so that means we have to say goodbye to Bonnie Sharp who has been a wonderful guest designer for us! Stay tuned...We have another super talented guestie coming up next week! Congrats to Marlena McDeavitt, our guest star stamper for this week! Check out her blog - Marlena is Faithfully Crafting - and leave some love. 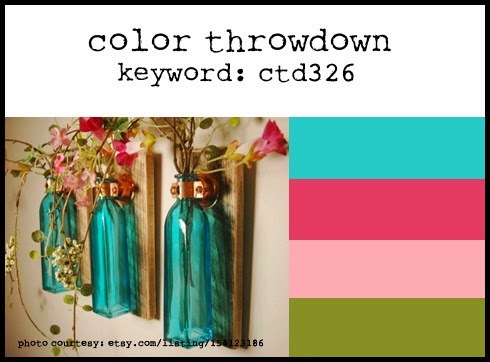 If you want more details on how to play along plus inspiration from the other designers, visit the Color Throwdown blog...or...click on the design team blog links below. Here's hoping you'll come and join us...can't wait to see what you create! It's the last Monday of the month, so that means it's tall and skinny sketch week for the Mojo Monday Challenge! 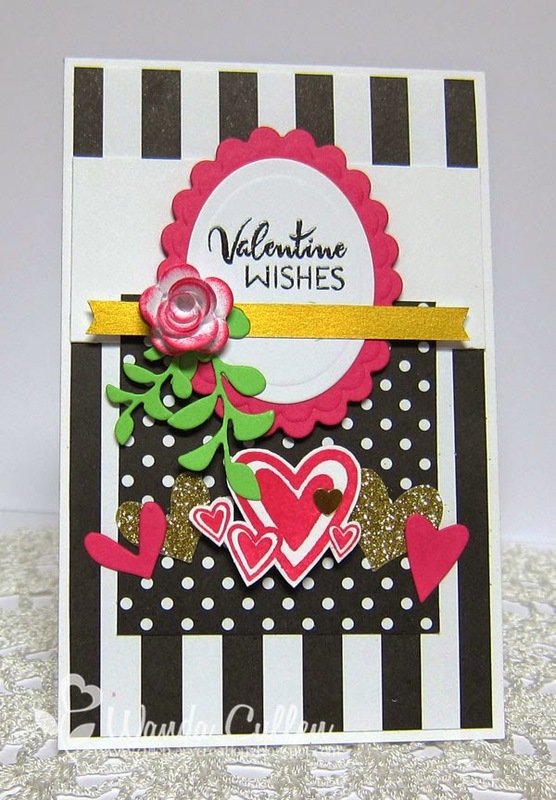 I love using a pop of hot pink and gold against black and white - perfect for a Valentine! 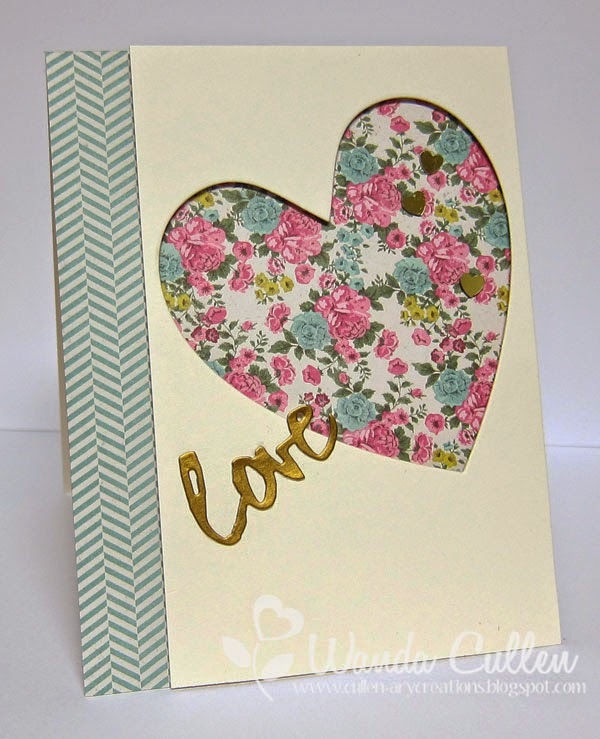 I used Verve's Heart Quartet and Leafy Sprigs dies in addition to a fussy cut heart image - stamped in Melon Mambo - from Verve's No Matter What stamp set. The sentiment is from Love Notes - also by Verve. A small rolled rose (sponged with Melon Mambo ink) and a gold sequin heart topped it off! 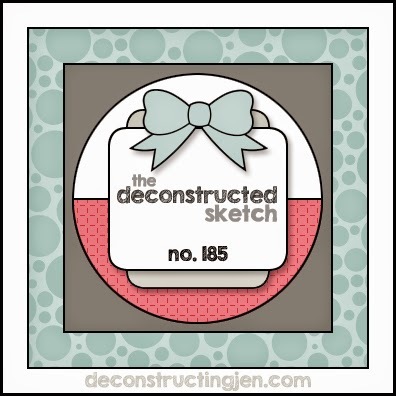 I'm playing along with My Favorite Things Color Challenge and Jen's Deconstructed Sketch #185. 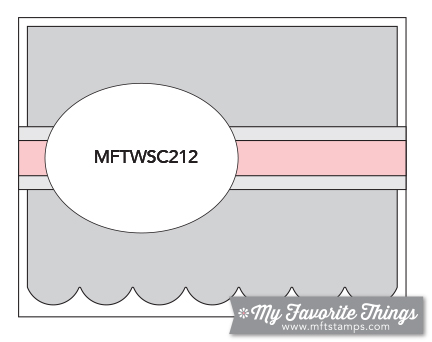 I stamped with Versamark and clear embossed the diagonal background stamp by MFT. 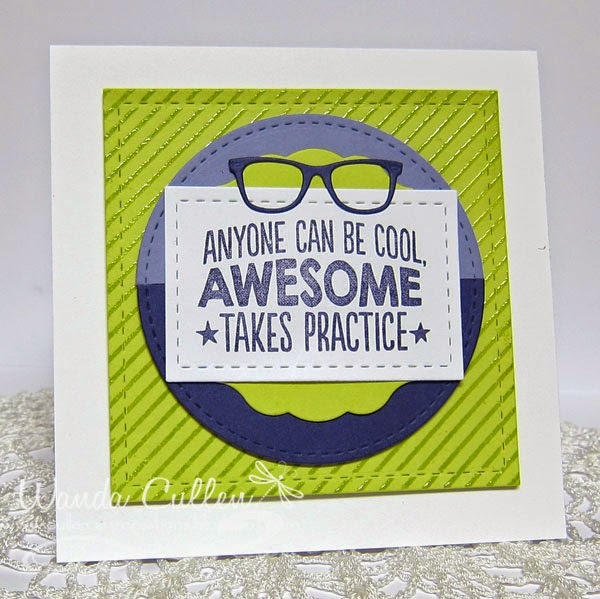 This awesome sentiment from MFT's Geek is Chic stamp set takes center stage along with some spectacular spectacles - a Geek is Chic Die-Namic! I refrained from any bling to keep it more masculine. So, there you have a quick and easy take on both challenges! 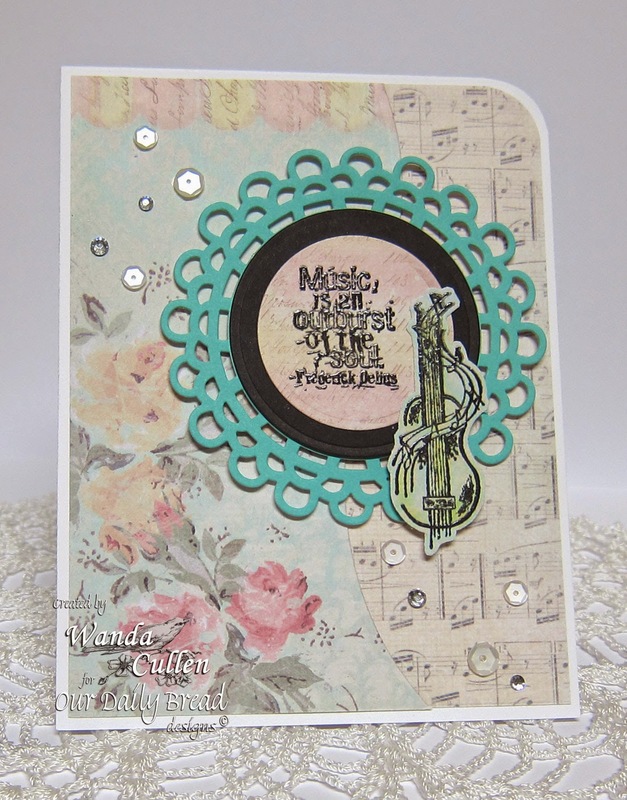 ACCESSORIES: Stitched square, rectangle and circle dies by Lil Inker Designs. 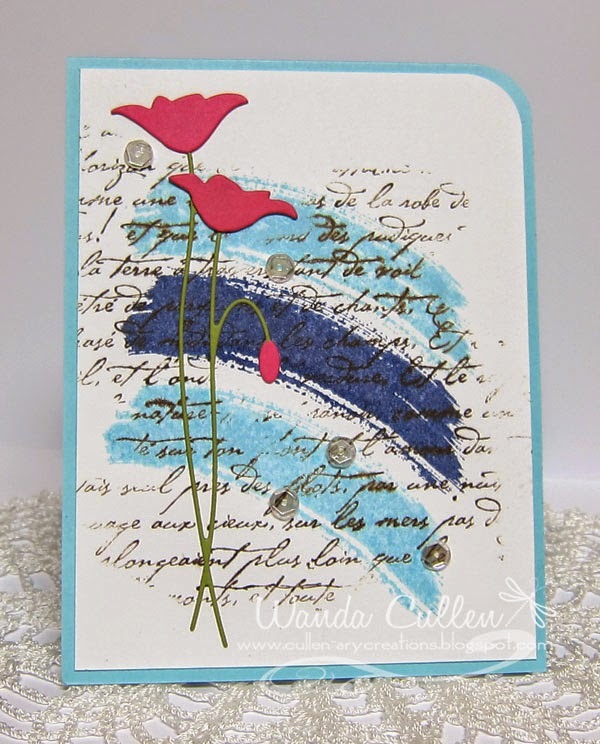 One of my all-time fave stampers is Angela Maine at From the Tool Shed blog, or as I better learned to know her by her SCS name - Arizona Maine! 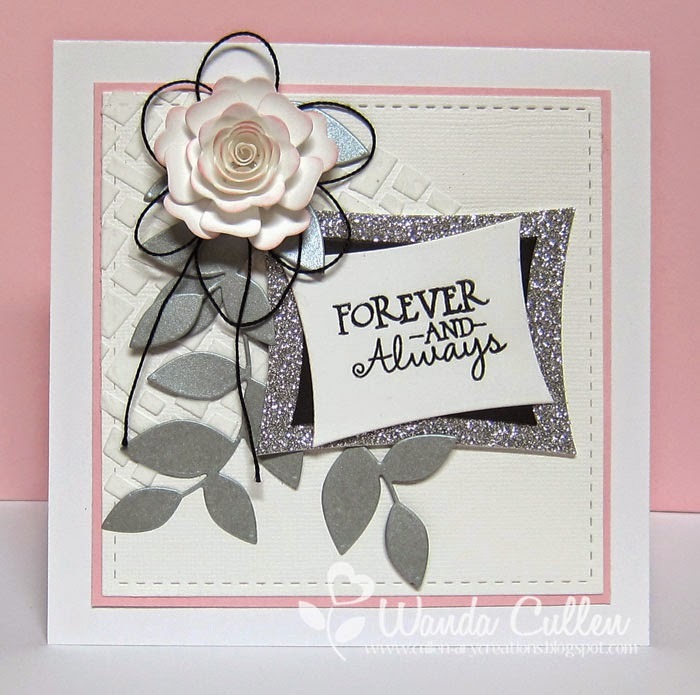 She has a real eye for design and pulls off the most gorgeous, simple yet elegant card designs! Today, SCS Inspiration Challenge has us CASEing one of Angela's creations. I chose this card on the left and feel like I totally butchered her whole "white space, tone on tone" concept. Leave it to me - lol! I didn't have a large enough word die, so this little love die seemed lost when I centered it in the open heart. I opted instead to add a splash of gold and also added a trio of gold heart sequins by Pretty Pink Posh...aren't they just the sweetest?! I'm going to have to put her Impression Obsession love die on my wish list for sure. My designer papers are from My Mind's Eye Kate and Co. "Cambridge Court" pad. The word die is from PTI's Wet Paint "Watercolor Wonder" die set. Thanks for stopping by...it's a snowy, wet, cold and yucky day here in VA. Hubby says roads are OK, so will be venturing out with some errands soon. 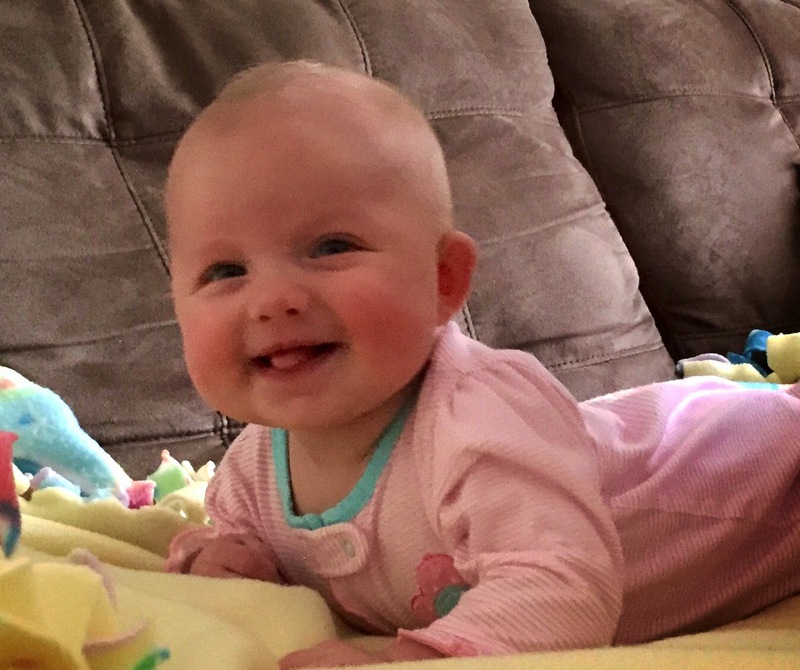 Just when I thought my scrapbooking days were history...a sweet little granddaughter arrives on the scene and I'm smitten! Of course I will need to journal this sweet life on some paper! The simple layouts of the Project Life concept make it so easy. 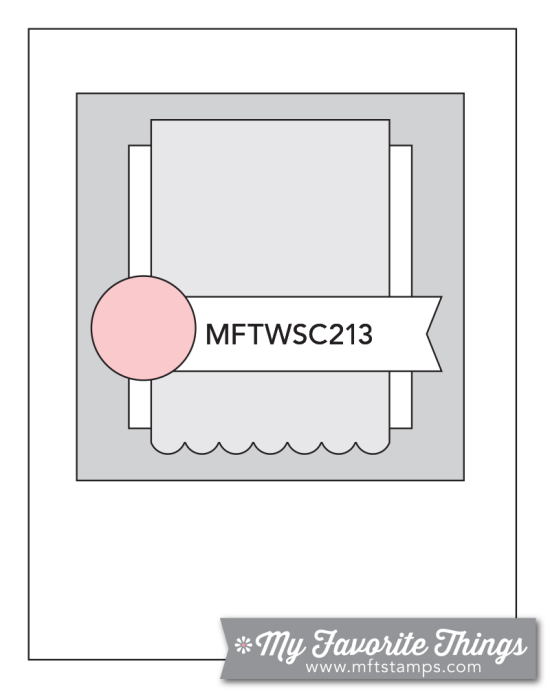 When I saw the new MFT Wednesday Sketch Challenge, I knew I wanted to create a title card in a 4" x 6" format. Very clean and simple! And so my Project Life journey begins. ACCESSORIES: Frame and Rick Rack Die-Namics by MFT; Star dies by ODBD; Dotted Swiss embossing folder by Cuttlebug; Adorning Accents Edgelits by SU. Hi everyone! 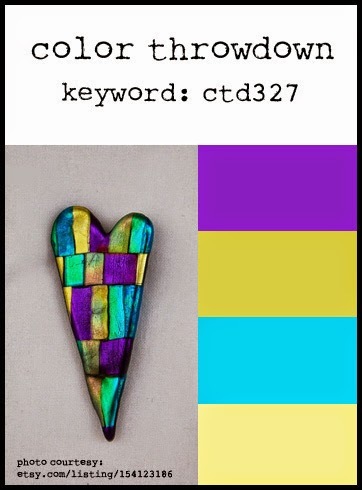 Check out the new, gorgeous color scheme chosen by Vickie this week for the Color Throwdown Challenge! I totally LOVE those wall vases! I might just have to check them out on Etsy (#dangerouswebsiteforme, #love). 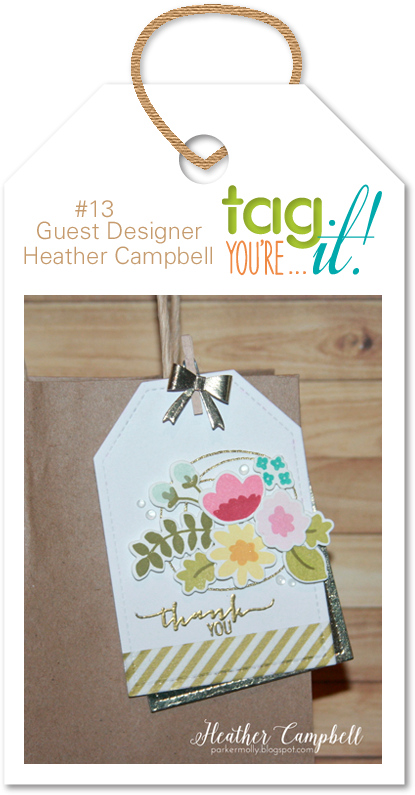 I'm also playing along with the first of the new year Tag, You're It Challenge #13 with an inspiring tag by the talented Heather Campbell! 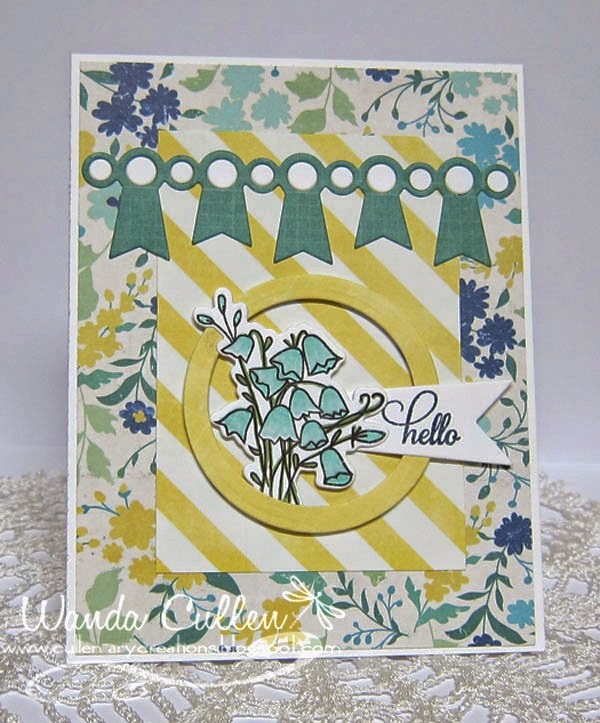 My card uses a new (to me) Sweetheart Tag die by Simon Says Stamp! I cut it out using Kraft, Bermuda Bay and White cardstock then changed up the inlaid pieces. I then arranged some florals from WPlus9's Pretty Little Peonies stamp set. I was inspired by the copper bands in the CTD photo and the touch of gold in the tag photo to add metallic gold embossing and a gold die sentiment (PTI's Wet Paint). Congrats to our guest star stamper this week - Kimberly Wiener! Check out her blog HERE. Also, we're blessed to have Bonnie Sharp as our guest designer in January. Be sure and check out her lovely creation! 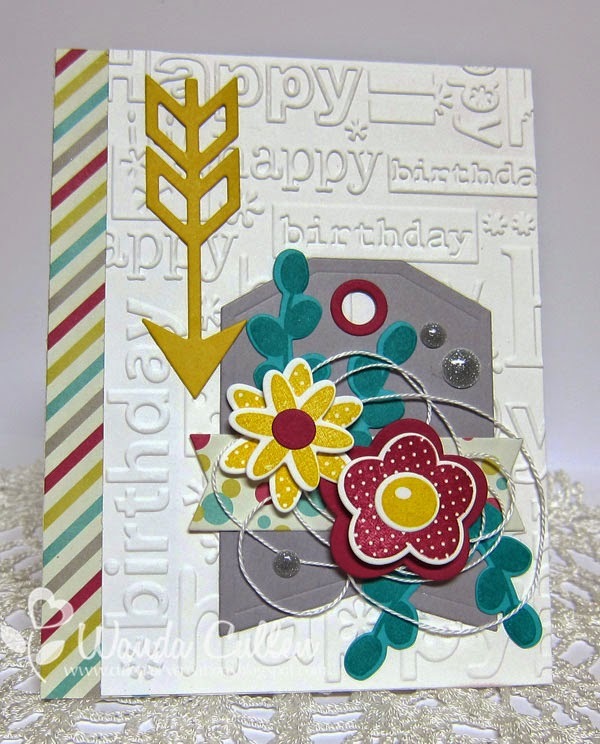 I needed a birthday card and decided that Heather Campbell's tag for the current Tag,You're It Challenge #13 was the perfect inspiration! 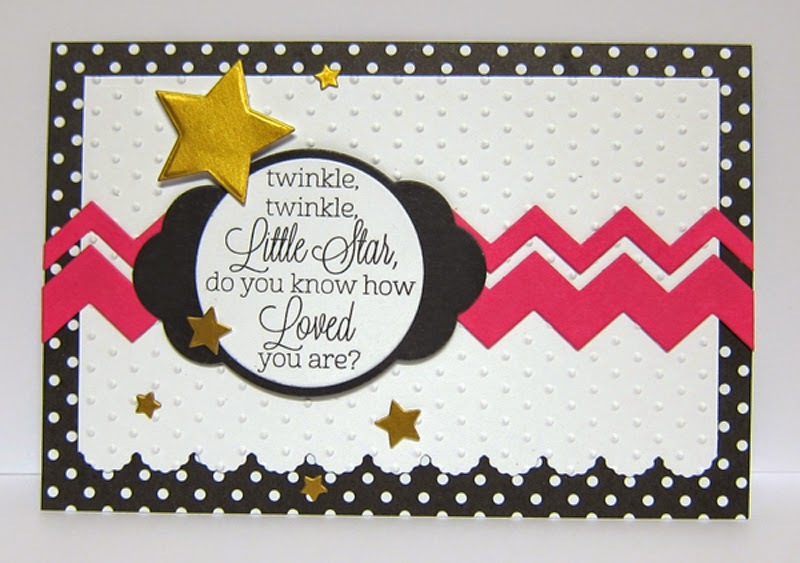 I love adding stripes to my card and opted to make a vertical border instead. My 'go to' tag right now is this Reverse Confetti die. I layered it up with a polka dotted banner, some looped string and then some fun posies - also by Reverse Confetti. I haven't used this Happy Birthday embossing folder in a really long time and decided that was how I wanted to convey the card sentiment. The inside reads "Hope your day is as fabulous as you are". STAMPS: Petals 'n Posies (Reverse Confetti), Fabulous Flamingo (Reverse Confetti) - sentiment. PAPER: Here is Happy 6x6 pad by My Mind's Eye, Purely Pomegranate (retired SU), Bermuda Bay, Crushed Curry and Smoky Slate (SU), White. INK: Bermuda Bay, Purely Pomegranate, Crushed Curry. ACCESSORIES: Tag, Arrow, Banner and Petals 'n Posies dies all by Reverse Confetti; enamel dots, EF by Cuttlebug, White string. Labels: Reverse Confetti, Tag...You're It! for it! Teresa Kline has given us this great sketch that was open for so many interpretations! Lots of patterns going on with papers from MME's Now and Then "Milo" 6x6 pad. I used 3 Verve dies (Award Banner, Flag It, and Bluebells) in addition to the Circle Nesties. I added some shading to the 2 step stamped bluebells using the Copic BG11 and YG63 markers. I popped the circle using thin pieces of foam tape and added some shimmer with a clear Wink of Stella shimmer brush over the bluebells. The sweet little sentiment was a Verve freebie with one of my orders. I couldn't resist being inspired by this cake for the new Inspiration Challenge on SCS! 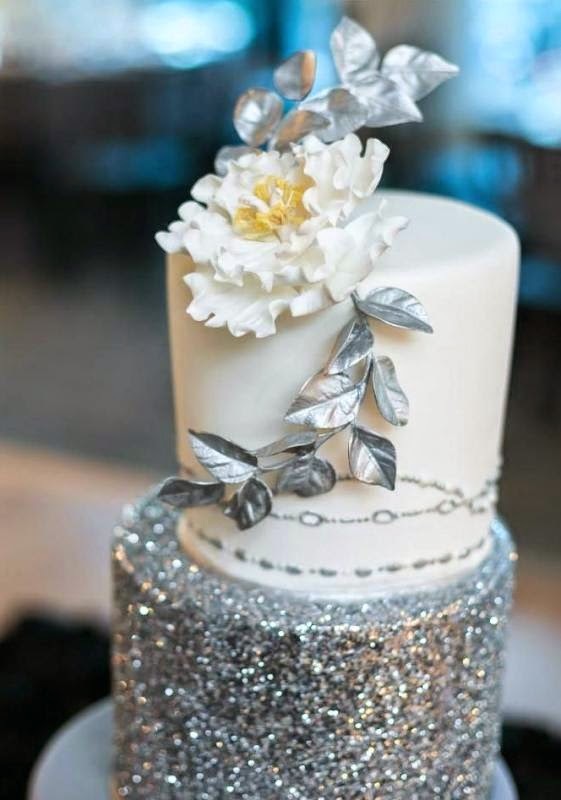 The cakes - so unique and non-traditional - are from the Mod Wedding Cakes Board on Pinterest! I needed to add a wedding card to my stash, so this was the perfect opportunity. Arielle has a great new layout for the Retrosketches Challenge, so I paired up the two and came up with this card. die cut leaves, layered wonky rectangles with a Verve sentiment, a bit of looped black thread and a large hybrid heirloom rose die by MFT finished off all my elements. I sponged the rose edges with Pink Pirouette ink and added the same color CS on the one frame layer to give just a wee pop of color. Instead of an A2 sized card, I went with a 5 1/2" square. STAMPS: No Matter What (Verve). 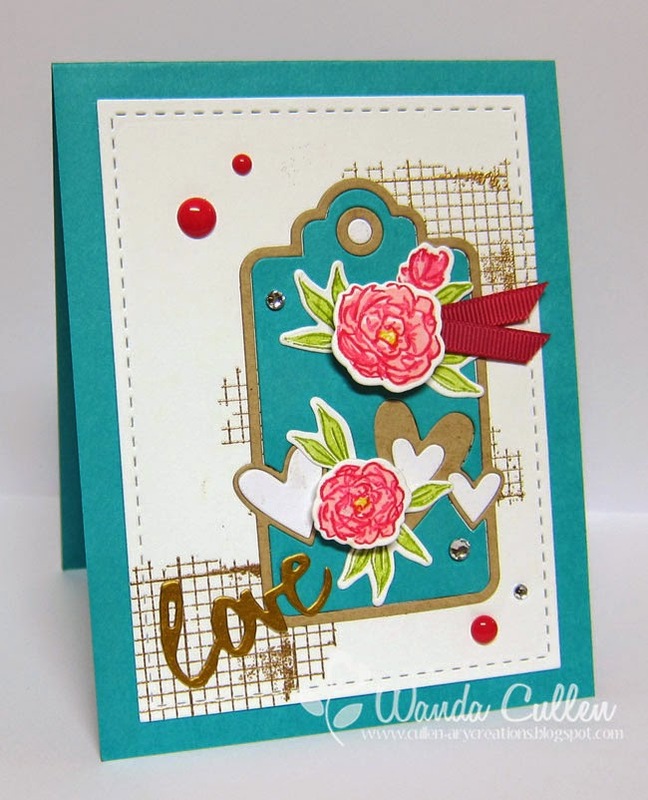 ACCESSORIES: Large Marianna Vine Background die by Poppystamps, Large Hybrid Heirloom Rose Die-Namics by MFT, Wonky rectangles dies by Spellbinders, Mosaic Heart stencil by Simon Says Stamp, black thread. Thanks for popping by! I'm working this weekend, so I need to get hopping and get ready! I'm back with a couple of cards that use some of the new products from Our Daily Bread Designs' January release. 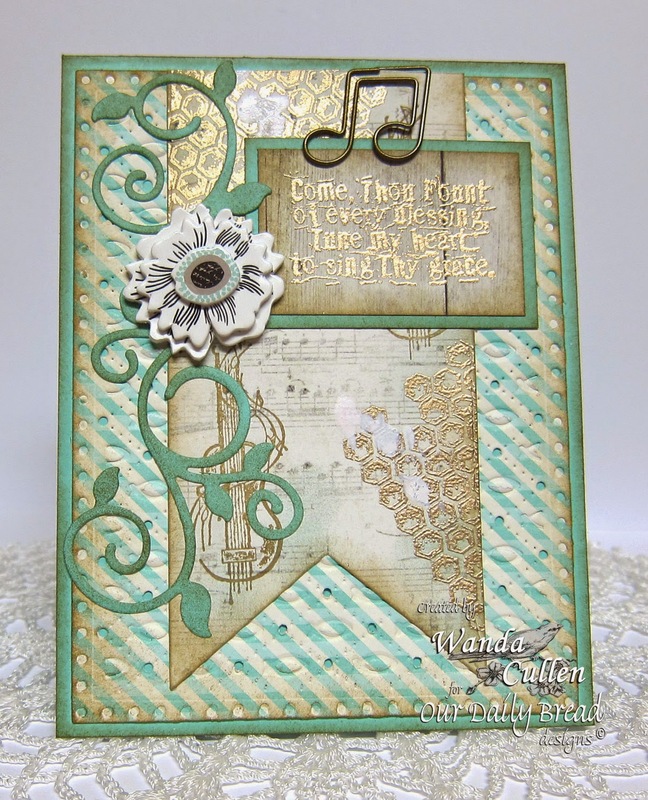 I'm featuring the embossing/cutting Faithful Fish Pattern die for the background and the sentiment and guitar images from Sing Thy Grace. Since the sentiments in the stamp set have a grunge style font, I wanted to sponge and splatter and add a hint of gold to achieve an eclectic, grunge look. I sponged Soft Suede and Oasis Green chalk inks randomly on the banner and also splattered some Picket Fence distress ink. 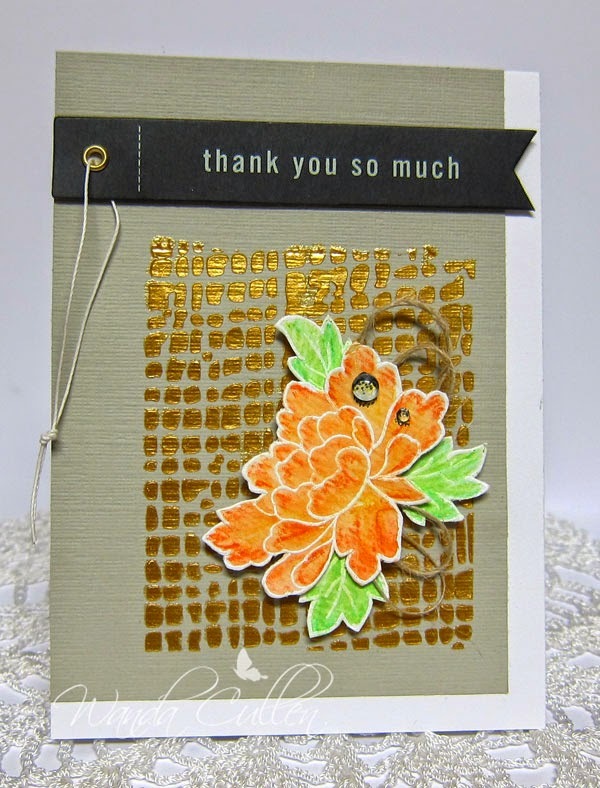 Other ODBD products include the Fancy Foliage dies and Honeycomb Mini stamp. The flower is a chipboard embellishment. I couldn't stop with just one card, so for my second one, I used Spellbinders' A2 Curved Borders One die with two different patterned papers to create the background. 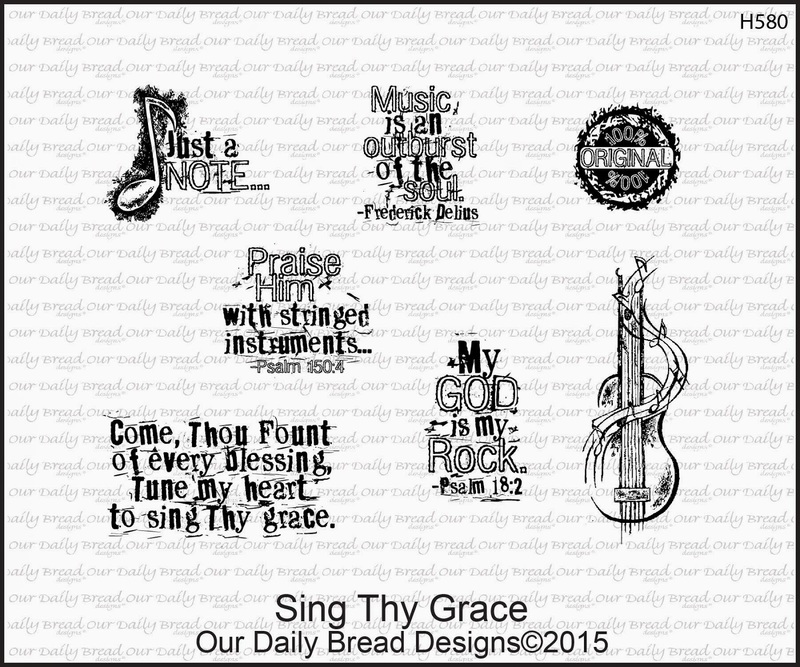 The sentiment and guitar are also from the Sing Thy Grace stamp set and were stamped in black and clear embossed. I fussy cut the guitar and popped it with foam squares. Some sequins and rhinestones were added for the finishing touches. A quick and easy card for the music lover in your life! Awww...I'm a scarf lover and it's the best thing about winter when I get to wear them! 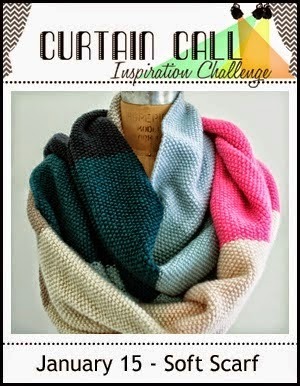 There's a new Curtain Call Inspiration Challenge up and Stacey has this great scarf photo for our trigger, so I knew I had to play along. The Ways to Use It challenge on SCS is to use only foreign language words on our creation. I immediately went to this old but loved retired French Script BG stamp by SU. After stamping several swoosh images in Tumbled Glass and Chipped Sapphire distress inks on watercolor paper, I then took the Walnut Stain ink pad and dabbed it on portions of the BG stamp. I didn't want a solid look. I finally got around to using my new to me Memory Box die in Old Olive and Raspberry Fizz CS. A few clear sparkling sequins from Pretty Pink Posh and I was done. STAMPS: Work of Art (SU), French Script BG (SU). 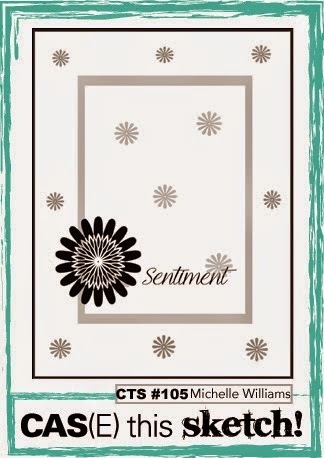 the Eye Chart sentiment stamp set. I'm playing along with the CAS(E) This Sketch Challenge #105 and Simon Says Stamp Wednesday Challenge where "It's a Guy Thing". Since I already had these supplies on my desk and I was running down to the wire with the challenge deadline, I went with another "eye" theme to add to the set I'm working on. I took liberties with adding a tiny banner to balance the card. I'm heading to bed now that my eyes can barely stay open. Nite all! ODBD January Release is Here!